Hear crisp, clear audio. Omnisonic Audio wraps you in your favourite music, shows, and more. Your built-in assistant can do it for you. 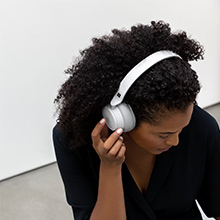 Just ask Microsoft Cortana to play your favourite artist, set a reminder, make a call, get answers to questions, and more. Crisp, clear audio envelops you in your music. 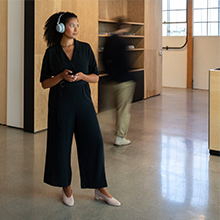 Easily control volume and adjust noise cancellation levels with on-ear dials. Even your voice is captured with exceptional clarity. Listen in comfort and style all day with soft ear cups and lightweight design. Use voice or touch to adjust volume, skip tracks, mute your mic, and end calls. Use your voice to get more done and leave your hands free. 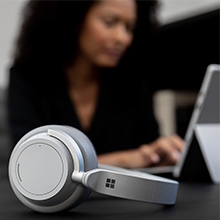 “Hey Cortana, join my meeting.” She can play your favorite artist, make calls, check your schedule, and more. Pairing to your phone or computer is easy. Listen throughout your day with up to 15 hours of battery life and fast charging for almost an hour of music in just 5 minutes. 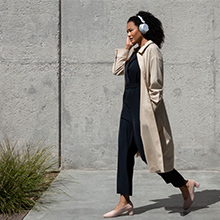 Adjustable Active Noise Cancellation technology means you choose how much you tune out. Turn up the silence on planes, trains, or when the surrounding noise is at its loudest. Turn it down to adjust when you want to be more aware of what’s going on around you, like in the office or on city streets. All you have to do is ask. “Hey, Cortana. What’s on my calendar today?” Cortana, your intelligent assistant, can play your favorite artist, start calls, answer questions, and more. She’ll check your schedule, send an email, or remind you about a task.